Nature provided us with the grey and white matter that gave rise to human intelligence. Our survival depends on using this gift to its full capacity. Susan Jacoby did a phenomenal analysis of the causes of the current “Age of American Unreason.” However, she probably did not consider two huge obvious fundamental causes, involving both city planning and personal finance, that contribute to it. They are such large problems, that they seem to be hiding in plain sight – to the point where Jacoby never discusses them in her magnificent book. Two main underlying causes for the “Age of American Unreason” are: the ubiquitousness of suburbia around cities, and productivity and cost of living far out-pacing middle class Americans’ wages. Wages have not been keeping up with increasing cost of living and productivity for decades. The first reaction to this by average middle-income Americans was to send women into the workforce – more for the purpose earning another wage than women’s liberation from the home. When this was not enough, Americans started working more hours, getting higher educational degrees, and had very short leave times compared to other developed countries in Europe. (Americans earned the reputation for being workaholics, but they needed to be to get by.) These past few years, with skyrocketing food and energy prices, Americans have hit upon their last defense mechanism: buying and driving less. The taxes, wages, and energy prices have reached the point of breaking the back of middle class America, which overwhelmingly resides in, of course, suburbs. 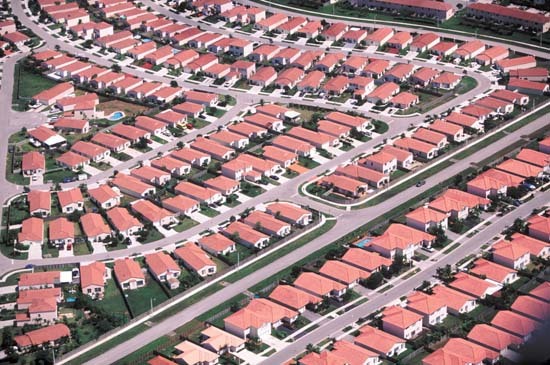 Suburbia has the effect of turning people into close-minded, cold, ignorant shut-ins. The suburban way of life stagnates the mind because it limits face-to-face interaction that could introduce one to new ideas, values, and cultures – the essence of cosmopolitan, pluralistic life. Conversation is essential to civic life. One of the pillars of democracy is conversation, and not just conversation with those who already agree with you, but also with people who may have foreign or contrary ideas. Aside from the influences of suburban settlement, average middle class Americans have to cope with their decreased quality of living, which in turn is caused by decreased purchasing power and worth of wages. (The top reason for filing for bankruptcy these days is healthcare cost. A national healthcare system would probably have ameliorated this problem.) The decrease in the value of minimum wage, vacation and sick leave, and other benefits means the average American has to work much harder than in previous decades. Where all these factors promote the Age of American Unreason is in the decline of family life and what used to be called “middlebrow” culture. All of this strain and time spent working has obvious effects on the quality children spend with their parents, whose behavior they model. In the past thirty years, parents have increasingly put their children in front of television screens for hours of passive “educational” programming and videos – almost to the exclusion of reading to their children. When the children get to school, the primary conception they have of learning is to be constantly entertained, and usually by some cartoon character. As a result, children have ingrained in them the expectation that reading will always be something to be avoided, and that moving pictures will be their preferred medium of learning. (The documentation on what this does to the mind – such as decreased attention spans and ADD – is vast.) The problem is compounded when exhausted over-worked parents get home, and “veg out” in front of the television. Obviously, children model what their parents do. And, as Jacoby points out, if parents treat reading “like spinach” and television “like dessert,” their children will do the same. Not only do children have less opportunity to have enriching experiences like quality reading and conversation times, but also adults. This is where the decline of middlebrow culture heavily impacts today’s Age of American Unreason. Middlebrow culture used to embody a virtuous aspiration to be like elites of society. It had a reverence for knowledge – a view that knowledge would not only “give you another star at a cocktail party,” but could also be used to edify a life. All this in the name of self-improvement, and as one’s duty as a citizen living in a open society. Today many factors are at work in putting not only the enjoyment of reading at risk, but also critical thinking itself. Aside from the appalling scientific and historical illiteracy and anti-intellectualism discussed in Jacoby’s book, the strains and over-work of middle class Americans eliminates the establishment of a Book-of-the-Month club, or any other social activity that acts as a forum for discussion on anything from personal to political topics. A National Endowment for the Arts survey showed that about half of all Americans under age 40 did not read any book (and by that they mean any book) the previous year. As Jacoby writes, if the first pillar of democracy is conversation, then the second is reading. In fact, one cannot have high quality conversational skills if one does not read. Conversation used to be practiced as an art form. Now, it is treated as anything but an art form. By the way, it should be mentioned that this has much to do with the dumbing-down of the mass media, which has the pernicious habit of prepackaging opinions into 5-second sound bites, and debasing public discourse. The deterioration of the two “pillars of democracy” and the emergence of the “Age of American Unreason” have everything to do with where people live, and the quality of compensation people receive from what they do for a living. These fundamental factors were glaring omissions from Susan Jacoby’s, The Age of American Unreason, and must be addressed if American life is to undergo a revival of its Enlightenment heritage and values. ~ by jsacc001 on October 10, 2008. A million thanks, sir. I will. an argument against the whole suburban “thing,” NYC. The heart of NYC is no intellectual center of the US. Instead it is an area usually known as “the mean streets,” filled with crime and cultural conflicts. 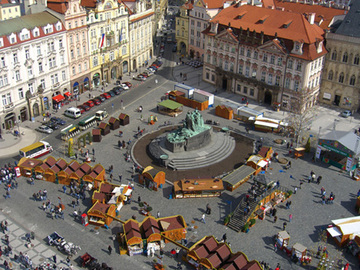 Addressing the first point, American inner cities suffer from urban decay, unlike some European cities such as Paris, London, Madrid, Rome, Berlin, and Prague (whose old Town Square is pictured above). It is not implied anywhere in this piece that American cities are more well-planned or well-managed for mitigating the effects of “The Age of American Unreason” either. Leaving the city-planning aside, the internet is not “picking up the slack.” E-books have very low readership and their failures are one of the worst-kept secrets of the publishing world. Also, the online reading seems like an activity that discourages reading for pleasure. Do the majority of people who read books online read them from cover to cover? It is doubtful that they retain more knowledge in their memory from reading online.Online reading seems to inhibit retention of material. Just because “everyone has access to internet” does not mean people will be more knowledgeable. One needs to have a framework (provided by good basic schooling, reading, and critical thinking skills) in order to use the internet AS A TOOL for GETTING information. But, one needs to have a frame of knowledge first to know what to look for on the internet. …why does “Online reading seems to inhibit retention of material.”?? Can this frame of knowledge be attained at city squares or universities/schools? It should be clarified that reading of a book for pleasure from cover to cover on a computer monitor seems less beneficial to retention than reading, say, a paper-back copy. Online reading of books is better for looking at reference books, for example, that were never meant to be read in full. Continuing to the next point, universities, schools, and (less so) areas of civic gathering are exactly the places where one gets the frame of knowledge. For example, you have to know that there is a Bill of Rights in order to look for the rights that constitute it. Similarly, you have to know that the Establishment Clause and the Treaty of Tripoli are documents produced by the Founding Fathers that unequivocally reject the notion that the American government is founded upon the Christian religion. Lastly, the stated view of city squares is quite pedestrian. There are vibrant “intelligent” city squares alive and well today. One just needs to look for them.